There is always a ton of ducks compared to the amount of geese because you attract more bees with honey than vinegar. OK maybe you think I am getting my cliches and games confused but really it’s all related, let me explain. When it comes to attracting tribe members, you have to give, give, give, give, give, give, give, give, give and then take. That’s right! NINE gives for every take. This works in social media and it works in the funnel. Give x 9 and then one ask. It creates trust. It gives them a sense of what you are and what you offer. Giving content that offers a ton of value makes a ton of champions and followers. And really otherwise, you are just shouting at them to buy your products and services. No one is cool with that. The golden question for any of us when we scan our timelines and emails is “What’s in it for me?” When you offer value, you show them exactly what’s in it for them. You can even use it to pump them up about what they are about to do. So back to my cliché/game mix-up. 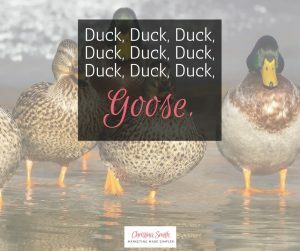 If you haven’t gotten it by now the ducks (and honey) are the value you offer and the geese (and vinegar) are the times you make an ask for them to do something. This could be an email for a free goodie, or it could be to invest in your course, program or coaching. Just remember there are at least nine ducks for every goose. Love on your tribe of followers and loyal champions. Be social with them and ask them what they need. Then provide it in valuable content, videos and conversation. Give, and then give even more before you make that ask. Want to talk strategy? Contact me and we’ll chat.